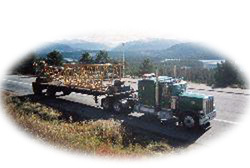 We are a heavy haul company, that hauls anything from earth moving equipment to the unusual items such as, rail cars, air plains or transformers. If it will go on the trailer we will haul it. We have tractors and trailers with 6 to 11 axles. We have Flip tail, lowboy, flatbed, step deck, stretch trailers for longer loads, removable goose neck, and double drop trailers. We can go almost anywhere in the US, but we prefer to stay in states West of the Mississippi River.